For many of us, especially those of us aspiring to work in the creative arts, there comes a time to decide between following an arguably more practical career path and taking the the leap to pursue what you're truly passionate about. We don't all have the courage or support to take option B, so seeing someone else succeed in it — especially when that person is also juggling motherhood — is pretty inspirational. 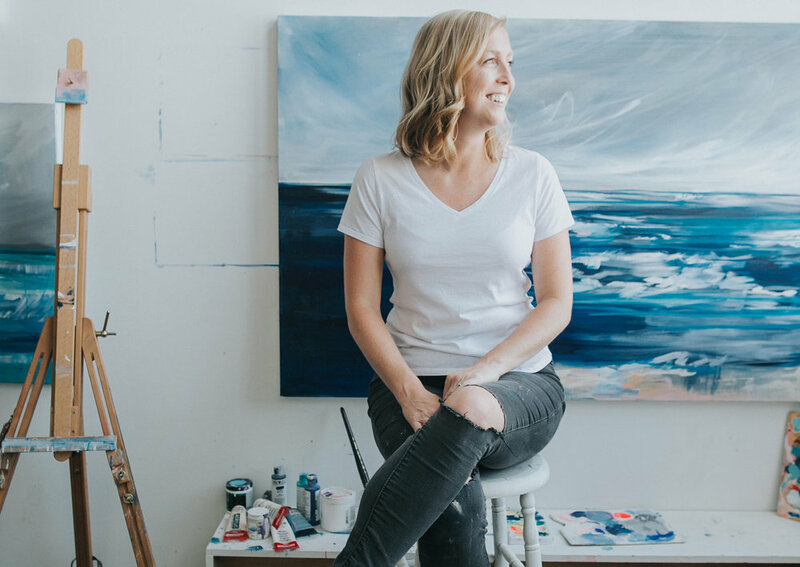 Such is the case with Brooklyn-based painter Megan Elizabeth, who just a few years ago took a chance and made the move from working as high school art and Spanish teacher to being a full-time artist — in what's widely considered to be the most competitive place in the United States to do so. The Maryland native, who's been entranced by the act of making art for as long as she can remember, couldn't have done it without the support of her husband. And what's more, becoming a mother has only reinforced her confidence in that decision. We recently spoke to Megan to learn more about her career journey, as well as how having her daughter affected the work she creates, and what she loves about raising a family in New York City. Have you always felt connected to the creative process? If so, what's your earliest memory of that? I was just trying to explain this to a group that I was teaching painting class to yesterday and I almost burst into tears while I was explaining it! The answer is yes. Art has always been part of my story. There isn't an "aha" moment in my past where I began thinking or loving or making art; I think it has just evolved silently alongside me as I've grown up. I was a curious little girl but I was terribly awkward and shy at school and I remember thinking that I was good at art, even if everything else seemed overwhelming and scary. I used to lay underneath my parents' coffee table as a little girl and pretend to color, but really I was coloring a masterpiece underneath the bottom side of the table. So yes, I have been sneaking art and being a tiny bit of a rebel into my life since minute 1. And how did you follow that passion in your formative years? One of my most impactful and concrete memories of "taking art seriously" was when my parents signed me up for a class at the Maryland College of Art and Design near my home just outside of Washington, DC. I remember being in a class with much older students and making art alongside them as a little kid. I felt so empowered and alive and my professor was this awesome older lady who basically told me to just keep going. She could tell that I was head-over-heels in love. At what point were you able to make being an artist your full time job? About 2 and a half years ago, I was finally at a crossroads professionally and it was very scary to think that I could either continue working a job I loved or explore the idea of "trying" to do something that I couldn't even imagine doing professionally. So, I went for it! It's been a wild ride and I have formed some of the most amazing friendships with fellow creatives since I took the plunge here in the city. I remember being on a date with my husband a million years ago and him saying out of the blue, "we can live in that house when you are a famous artist." I giggled and thought he was just being charming, but without his support and gentle suggestions, I can't imagine having been brave enough to take this course in life. How do you feel your work changed after becoming a mom? My artwork exploded after becoming a mom. I had struggled a lot with self-doubt as a younger person and never really thought that I was tough or strong until motherhood rolled around. Once I had my daughter, I felt physically and emotionally stronger. I was up for the challenges that life had in store for me because I had this little human to prove it to! I find that my "me" time is so precious as a mother that now when I am able to paint the ideas are so abundant. I sometimes even wake up in the middle of the night with ideas for future paintings and have to make a note so that I can go back to sleep! My daughter is my muse. I hope she grows up knowing that she propelled me into believing in myself and following my dream of making art every day. Is your daughter very artistic as well? We are very similar, but we are also total opposites. She is very creative, but her mind works in a more analytical way. She likes facts, straight lines, and numbers. I like crazy oceans, messes, and chaos doesn't stress me out. She builds things almost every week with shipping boxes and we go through rolls of tape, glitter and glue sticks like nobody's business, but I love it! I guess it's nice that I don't mind messes because it allows her to be a bit more creative — so we're a perfect fit. What do you love about living and raising a family in New York City? New York City is an absolutely amazing place to be a kid. It has been so incredible to live here and to see the world through my young daughter's eyes. She has learned so many of life's important lessons about fairness, compassion, acceptance, and kindness because of her exposure to city life. It's been really interesting to almost feel like we have studied abroad together as a family while living here so far. We have also changed how we live quite a bit and instead of focusing on things, we focus on adventures, time spent together, and exploring the city. It is really quite awesome to learn alongside your kid, instead of having all of the answers. So many people dream of being able to be a full-time artist. What's your best advice for those people? If you are dreaming of fame or importance, that might not last. If you dream of helping people, follow that and never let anyone discourage you. If you dream of making something forever and ever, do that full speed ahead. If you go on vacation and find yourself drawing instead of sitting on the beach, draw more and more and more. If you are in a cafe and you can't help but write down ideas in a sketchbook, do that every single day. I think it's important to realize that everyone has a little spark within them; it's just waiting to be unearthed and that part takes a lot of courage, a bit of luck and load and load of hard work.